When our Nordhavn trawler sales representative Jeff Merrill told my wife Maria and me that the commissioning process for our new boat would take approximately four to six weeks after the boat arrived from the yard in China, I was already stressed from the eight-month build cycle. It had taken us four years of research and some creative financing to reach the point of ordering our dream boat and we were not excited about this news. I kept asking myself what could possibly take four to six weeks to complete on a brand-new boat that was checked out prior to leaving the yard? The simple answer is, a lot. After now surviving two new Nordhavn trawler commissionings, I can honestly say that with a little pre-planning, establishing realistic expectations, and implementing a few other secrets we discovered along the way, the process doesnt have to be a long, drawn-out nightmare! As we start planning for our third trawler purchase and its required commissioning process, we thought it would be wise to dust off our pre-commissioning checklist that has served so well in the past to help us set realistic expectations. While not foolproof by any means, these simple steps have allowed us to save time, money, and keep our stress levels as low as possible. If the dealer or builder estimates your commissioning process to take six or eight weeks, realize that this is just an estimate. Todays boats, with their complex systems, take time to check out and troubleshoot problems. Remember, the whole intent behind the commissioning process is to run all systems through their paces and look for potential trouble before you head off on your own. If there are issues with the boat, this is the time you want them discovered and addressed. Whether it is a fluid leak that requires a simple bolt tightening or a partial system removal and replacement that may take days, nows the time to fix it. The crew is working to an estimate, so try not to make serious or costly schedule commitments around the completion date. Most builders will provide you with a grace period after commissioning where there is no charge for leaving the boat docked at their facility. Use this window to firm up plans to fly in family or crew to join you on board. If you are hiring a captain to help you with training or delivery, negotiate a schedule window for his services. I remember one couple who hired a captain to provide them with training and delivery of their new boat, but they were stuck paying his daily rate while the boat sat tied to the dock waiting to finish the commissioning process. No one aboard was happy and the couple ended up spending thousands of dollars for a captain they could not use. This may sound funny, but there is a lot of merit to this statement. Adding items during commissioning is costly and timely. Most builders will charge you an hourly rate for anything added during the process and believe me, it is not inexpensive. I honestly think they inflate the rate to discourage people from making changes or adding items. Understand everything you want when you order the boat and have as much of it installed at the factory as possible. If you are going to add items, possibly with a subcontractor, you may want to schedule that after you have taken delivery of the boat and during that small window the builder allows free dockage. We found that having all of our interior work performed after the commissioning process worked well. The designer had access to make measurements during commissioning, and then went off to make the carpets and window covers, requiring only a day for installation. When he was done, no one else came aboard to dirty things up. Obtain a copy of the commissioning checklist and proposed schedule (if you can), and then conduct weekly follow-ups with the supervisor. If you stay out of their way and let them do their job things will go smoothly. We found that making an initial visit when the boat arrives to meet with our sales representative and commissioning supervisor allows us the chance to perform a walkthrough and discuss the commissioning plan. We then limit visits to once a week, usually on a weekend when the crew is not working on the boat. We take notes and email them to our sales representative to forward to the commissioning crew. As with any new boat, there will be a shakedown cruise and time training on board. Again, this needs to be planned after commissioning so you know everything on the boat has been formally checked out. We had a scary experience on our first boat when our sales representative cleared the way for us to conduct an afternoon of training during the last week of commissioning. After a few hours of close-quarters maneuvering, the gear shifter was losing its responsiveness and we headed back to the slip. Just as we entered the busy harbor, the transmission became stuck in neutral. While we did finally make it safely to the slip with some help from vessel assist, it was an experience we could have done without. Only after we were securely tied to the dock did we realize that the commissioning crew had failed to tighten all the screws to the Morse controls; the shifter lever came loose after a few hours of use. Make sure to have all your paperwork (final payment, insurance, offshore delivery, LLC, etc.) in order. There is a lot of paperwork associated with taking delivery of a new boat and most of it is tied together one way or another. Offshore deliveries can take a full day by themselves and involve attorneys, delivery captains, sales representatives, and documentation companies. If everyone is not on board with their paperwork at the right time, you can end up wasting an entire day. So there you have itfive simple-but-important steps to surviving a new-boat commissioning. While these steps have proven effective for us in the past, we recognize that with each purchase new opportunities will arise that will require our attention and patience. Thekey word is patience! 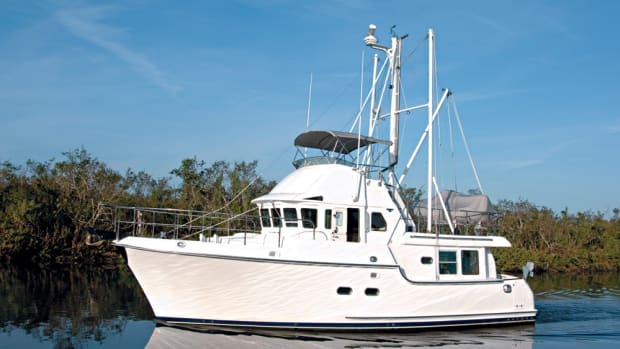 Over the past five years, John and Maria Torelli lived part time aboard their two new Nordhavn 40 trawlers in San Diego, California, and are currently planning for their third boat. They have written numerous articles related to the lifestyle and the true costs associated with owning and living aboard. Their book, Life Is A Journey, Why Not Live Aboard A Trawler is available at www.lulu.com.